INDIA has a fabulous history of weaving cotton. In fact, MADRAS design cotton is named after the city where it's made. Today, you can buy fine textiles for pennies a yard and resell that yardage for big dollars. You can buy finished products, dishtowels for 50c each, Madras napkins for 30c. each and resell them for a big profit. "In the international commerce of the pre-industrial era, spices and textiles were the principal commodities. India in particular was known for the quality of its textiles, and for centuries was involved in a brisk trade with Far and Southeast Asia. European companies worked their way into this commercial nexus in the early sixteenth century. The Portuguese were the first to arrive, having discovered a sea route from Europe to the East that allowed them to avoid the heavy taxes on goods sent overland through the Middle East. The British East India Company received its charter in 1600 and the Dutch East India Company was founded two years later. These agencies bought textiles in India for silver and gold, exchanged them for spices grown in the Malay Islands, and sold the spices in Europe and Asia. Soon Indian textiles were exported directly to Europe, where they became highly fashionable. 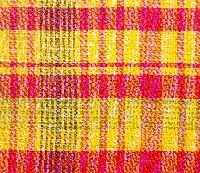 The popularity of Indian textiles is evidenced in the number of words that have made their way into English: calico, pajama, gingham, dungaree, chintz, and khaki and MADRAS.The luxury textiles coveted for centuries are now collected in museums, where they are often grouped and studied. Fabrics. Cotton, silk, and wool are the three materials from which textiles are woven. The cotton plant grows in many regions of India, each of which produces a different grade product. Wild silk moths native to the central and northeastern parts of the country (and different from those found in China) are the source of silk. The fleece of mountain goats raised in the cold regions of the country—Kashmir, Ladakh, and the Himalayas—is spun into wool. Pashmina (also known as cashmere) is made from the fine inner fleece of wild goats collected from the rocks and bushes on which it is shed in the summer. Dyes. The most common colors of red, black, blue, violet, green, and yellow are obtained from plants and minerals native to the subcontinent. Indigo plants are processed and traded in the form of dried cakes that are used to create different shades of blue. Red dye is extracted from alizarin-producing plants and trees, such as the chay or the madder, and yellow from turmeric or saffron (the latter mostly for silks). Black is created by mixing indigo with an acid substance such as tannin. Green and purple can be made by layering yellow or red dyes over blue cloth. Cotton, unlike silk and wool, must be prepared to receive color. The fixative agent, known as a mordant, is a metallic oxide (usually alum and iron) that combines with the dye to bond onto the fiber. Printing, resist dyeing, and painting. Mordants can also be used to create patterns. If the mordant is drawn or stamped with wooden blocks onto the surface of the fabric, the dye adheres only where the substance has been applied and the pattern appears after the cloth has been washed. Resist dying, also known by the Malay term batik, works in the opposite manner, by employing substances such as wax or mud that block the adherence of a dye. After design elements are painted or stamped onto the surface of the cloth, it is immersed in a hot dye bath. The shade and depth of the color is determined by concentration of the dye, duration of the immersion, and number of dyeings. The color is revealed on contact with air. Kalamkari, which literally means "pen-worked," is a multi-step process for creating designs. The cloth is first stiffened by being steeped in astringents and buffalo milk and then dried in the sun. The red, black, brown, and violet portions of the designs are outlined with a mordant, *(from French, to bite, and the acid of a mordant BITES and fixes the dye, makes the dye HOLD ON TIGHT) and the cloth is placed in a bath of alizarin. (crimson). The cloth is then covered with wax, except for the parts to be dyed blue, and placed in an indigo bath. Afterwards, the wax is scraped off and the areas to be yellow or pale green are painted by hand. Carpet weaving. Little is known about carpet production before the Mughal era because no carpets survive from before the late sixteenth century, and the terms used in written sources are unclear. However, the earliest carpets woven in India were probably flat- or tapestry-woven. At some point, pile-woven carpets became more popular, some say with the influence of Persian weavers. Cotton and silk are most commonly used for the foundation of the carpet and wool or silk for the pile, pashmina wool for the finest ones. MADRAS (the old name for this city. 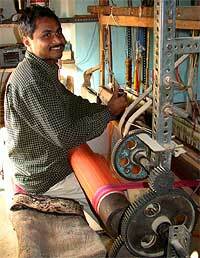 Chennai grew into it and that name predominates,) is the big, historical cotton weaving area. This fabric is for kitchen aprons, potholders, tea towels, dishtowels and dinner napkins. The more subtle colors are used for daytime sports wear. It's light, it breathes, it's sporty. 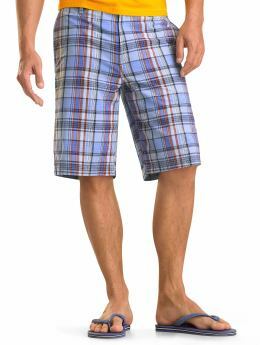 American fashion houses have been using MADRAS (in its firmer weaves,) for sportshirts, sailing shorts for 5 decades. As a kid, I used to see NEW YORKER magazine ads at Long Island or Connecticut sports shops. Madras was what the Kennedys wore as kids. But they wore the subtle colors, khakis and soft teal blues. Ethel wore a shirt dress with a self-fabric tie, button down collar, roll up sleeves. Ted, Jack and Bobby wore yachting shorts. Visit Chennai or MADRAS and buy l00 yards there or via on the internet, straight from the Factory. I showed him my favorite type of plaid, wide stripe. It isn't SCOTTISH plaid, no green/red/black at all. it's THIRD WORLD in mood, THAI weavers have done it for centuries. It is done in yummy candy pastel colors. You can buy all kinds of textile yardage from a big cotton dealer there, Stephen Joseph. joshuabuying @yahoo.co.in And you can design your own fabric. Ask for prints. GOOGLE has enuf amusing print designs. Google holstein cow. Google fish designs. What the MADRAS dealer manufactures now and sells are the most beautiful dish towels, aprons, place mats, napkins, He wholesales the dishtowels for 50c each, napkins 30c each....and so on. Haggle. They expect it in the Third World. I wrote him after he sent me a yard of fabulous, handwoven, wonderful, firm cotton. Like the linen you'd use in a man's summer suit. It was so firm, that I imagined it could be stretched on bars for painters to do canvases. Primed with gesso, then painted. OR PRINTED with new serigraphy techniques. A friend of mine is making vintage design tablecloths. She is looking at printing textile paint on fabric. Just had a silk screen company do the copies, registers. She bought cotton in LA's wholesale marketplace. Found SILK SCREEN corps all over the city. But if you're going to go to that trouble, Why not do GICLEE's or COLOR LITHO's on this fabric and sell them as paintings for a thousand each. I LOVE the work of Ruski painter, now in California, man named YUROZ He prints his original designs with serigraphy or silk screen. (his URL is BELOW) He gets 3 thousand dollars each painting. He makes 150 of each design. I think that means he gets a quarter million dollars out of every edition of his work. Meaning one image, 150 times at 3k each. YOU CAN GOOGLE HIS NAME and find his galleries, websites, biographies. AND HIS PAINTINGS. So once you have a really excellent cotton textile, you can make suits, upholster furniture, or make paintings which is the really easy money. Last, TO GET A GOOD LOOK AT a modern HINDU city, check out BOMBAY, now called MUMBAI. LIVING IN INDIA could be a total blast. Just don' t drink the water!Make sure all H20 is bottled and seals unbroken.